Once again delving into the halcyon days of my childhood, I remember relaxing during summer vacation and being able to catch film matinees on the local TV stations. One film seemed to play fairly regularly and was everything for my young pre-teen mind: scantily clad space women (which are different from Amazon women, but this film had them too), cavemen, laser swords, cheeky robots, space battles, ice worlds, desert planets, prison planets, city-sized spaceships. This film seemed to have everything a 10-year old would want in a film. 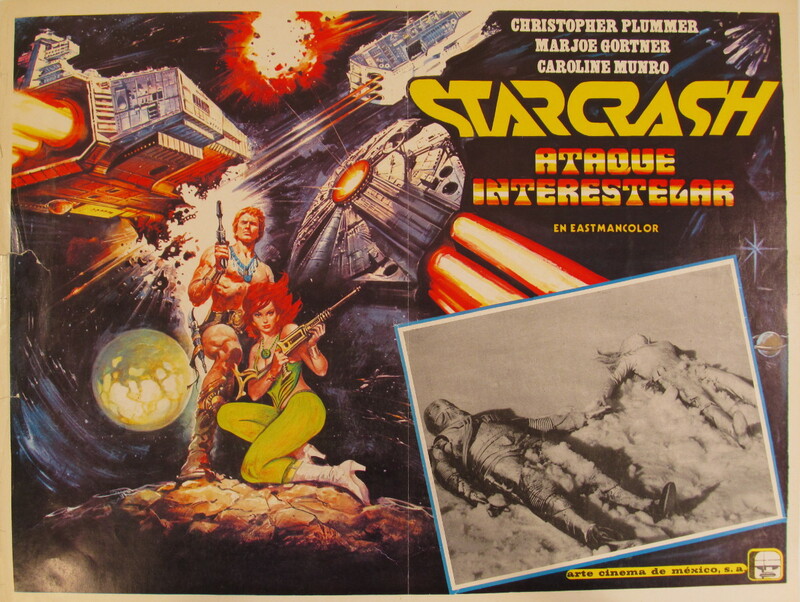 That film was 1979’s Starcrash. As it was the mid-80s when I first saw Starcrash, it was grainy, pan and scan, and interrupted by commercial breaks. Surprisingly the commercial breaks don’t cut up the film, so much as force it to pause. The film is edited at a breathtaking pace. Clocking it at just over 90 minutes, all those bits I mentioned above zoom by. There’s no pausing to set up story or motivation, it’s one set piece after another. Why does our hero, Stella Star (Caroline Munro), try to evade the space police? No idea. Let’s capture her, immediately put her on trial, and then force her onto a prison planet where she immediately escapes and inspires a revolt. All this happens in the first 10 minutes of the film. Picture yourself playing with a young kid. Say you’re playing Star Wars, and then out of the blue the kid says, “And then the dinosaur attacks.” This film is a little bit like that. Scenes are set up and then the screenplay throws a non-sequitur in and Stella is being attacked by troglodytes. You have to admire the fun of just throwing things at the wall and including them in a film, even if it doesn’t always work. Required shot of Stella being held captive by the Amazons. Besides the soft-light focus of Caroline Munro, the film also includes Marjoe Gortner (incredibly interesting life, Google him) as her partner in crime, Akton; Judd Hamilton as the robot policeman Elle, who ends up being her strongest ally (not to be confused with Hamilton Camp who provides the voice); the first major role for David Hasselhoff as Prince Simon; and a somewhat slumming Christopher Plummer as the Emperor of the Universe. Supposedly, he only took the role so he could spend time in Italy on someone else’s dime. The film is badly overdubbed, and the dialogue does not always line up perfectly with the lip movements, but this ends up being another quirky reason to love this B-movie. 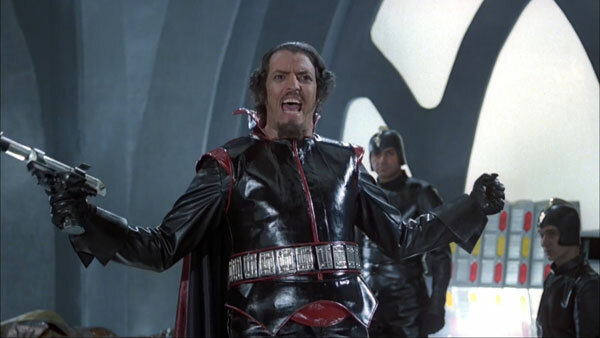 I haven’t even mentioned Joe Spinell as Count Zarth Arn; he is supposed to be the big bad guy but feels tacked on. On big-budget films, I’ll sometimes say that you can see the entire budget on the screen and nothing was wasted. The budget for Starcrash was $4 million, and it almost feels like the entire crew went on a bender, spent all the money, woke up hungover the next day, and decided to dig under the couch cushions so they could make their movie. In actuality, the money is being used, but it’s definitely B-movie sets, and I would bet that these sets or set pieces turn up randomly in other films to offset the costs. The costumes are bright and vivacious, and of course, the film tries to appeal to the prurient interest and everything is as snug as can be. Akton’s hair should have its own film, it has that large of a presence. In Star Wars, during the battle to destroy the Death Star, the camera skims along the surface and shows explosions on camera. This moment lasts five to ten seconds. 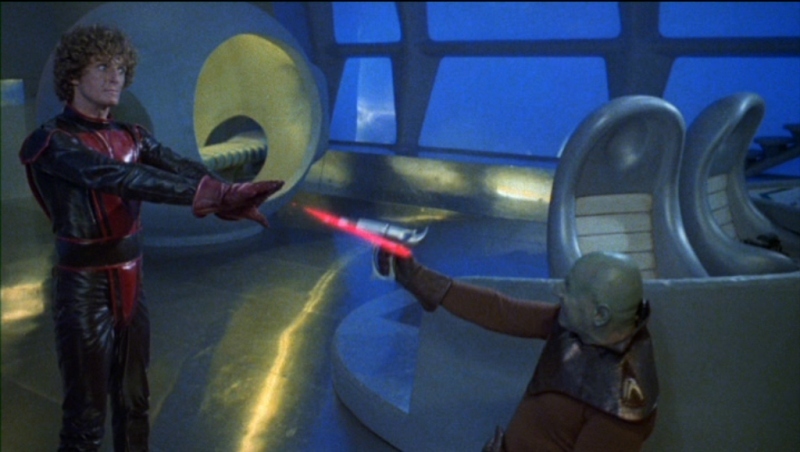 In Starcrash, they decided that if it worked for ten seconds, let’s see if it will work for a minute. It doesn’t, but it goes from being a steal from Star Wars to being awkward and funny. The intended humor in the film tends to fall flat, but there is a lot of unintentional humor that still gives me loud belly laughs. If you think I’m hating on this film, that’s the furthest thing from my mind. I enjoy Starcrash tremendously. You do have to be in the right mood and definitely go into it knowing it’s a B-movie in all its glory. But it is a glorious film. If you like Flash Gordon, then take another 10 steps down and you’ll find Starcrash. Shout! Factory released a cleaned-up widescreen print with Dolby sound a few years ago on Blu-ray, and it’s never looked as good as it does now. Plus, how can you go wrong with a film that when Stella is reunited with the love of her life, Prince Simon, instead of a passionate kiss, they hug. It’s sweet and totally works on a 10-year old brain. I kinda shipped Elle and Stella. Bummed that it never worked out. Seriously, if you find a robot who also happens to be a lovely Southern gentleman, marry him, gosh dang it!